Here's this week's "Boise Weekly" illustration. The story deals with Idaho Senator Jim Risch, specifically where he stands (or doesn't stand) on environmental issues. The copy takes the position that Risch has made a fairly equal number of decisions on both sides (benefiting and harming the environment). 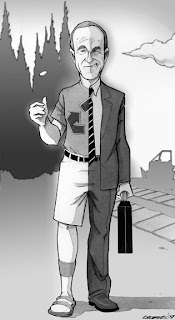 I decided to use a parody of Harvey Dent/Two Face from "The Dark Knight". Whether or not the reference will be obvious is unclear. It's a little more difficult to portray the split personality of Harvey Dent without the obvious facial disfigurement. Risch is a pretty normal-looking man, so I used shadow covering half his face as a replacement for horrible burn scars. Aside from that, I used a Photoshop gradient on both sides (lighter for pro-environment and darker for anti-environment). On the plus side, I showed this to a friend who recognized (after some uncertainty, it should be said) that the subject was meant to be Risch. Score.